Recently one of our Sporturf™ dealers, Brian Cockfield of The Sports Flooring Group, worked on a fairly unique project at a branch of the Greater Charlotte YMCA called Sara’s Y. 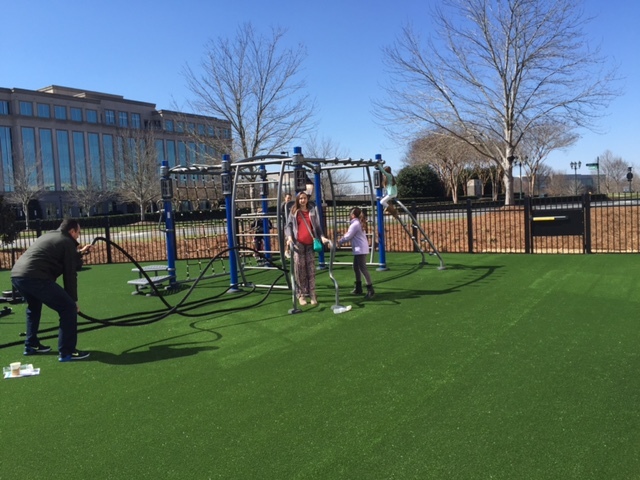 The project consisted of adding an outdoor functional training area complete with Fast Grass AT740 and a fitness rig for various exercises and strength training. The Fast Grass product line is a high performance, non-infilled turf that has all the advantages you’ve come to expect from synthetic turf without the mess of rubber infill. The members of Sara’s Y will be able to enjoy their outdoor training area despite the weather conditions.